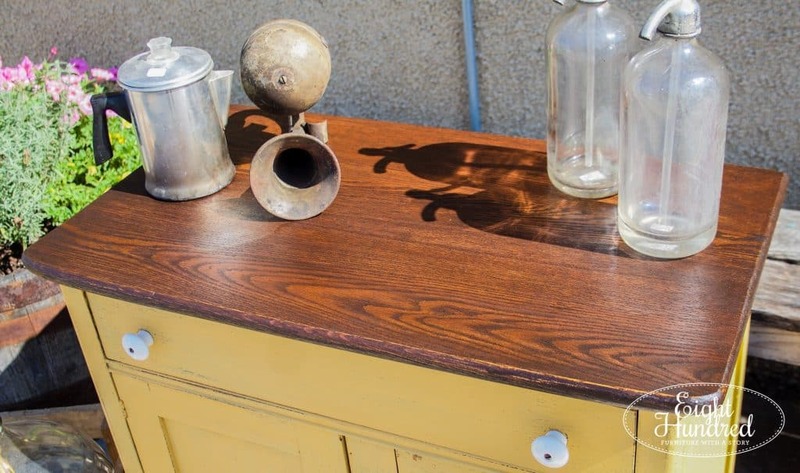 ‘m often asked how I refinish the wood tops to my dressers, nightstands, and desks. I’ve been kicking around the idea of making a video tutorial and even doing a workshop to teach the process. I personally learned by studying Miss Mustard Seed’s video on the topic, so if you have a chance, pop on over to her You Tube channel to watch. For now, I’ll share my method in blog form. 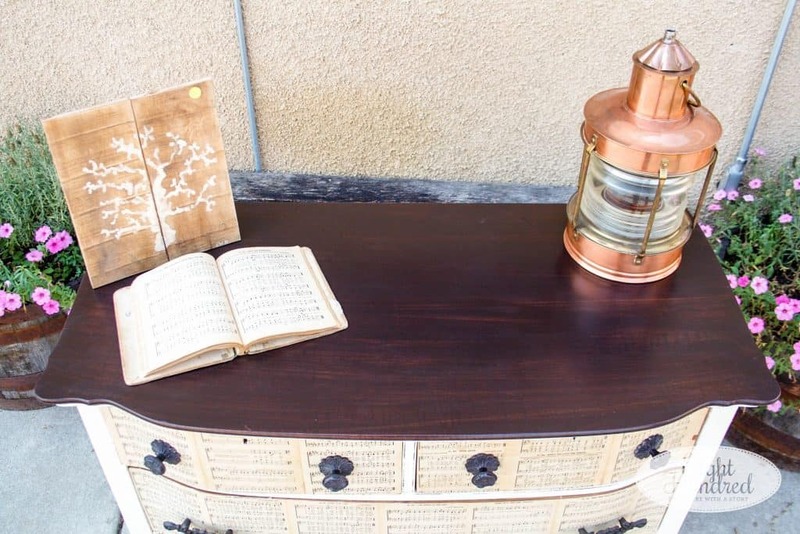 I’m working on a cute little nightstand, and the wood on the top is in pretty good condition with the exception of the aged finish, as you can see below. I know it looks like a lot, but it’s not as bad as you think. Take a deep breath and let’s do this! 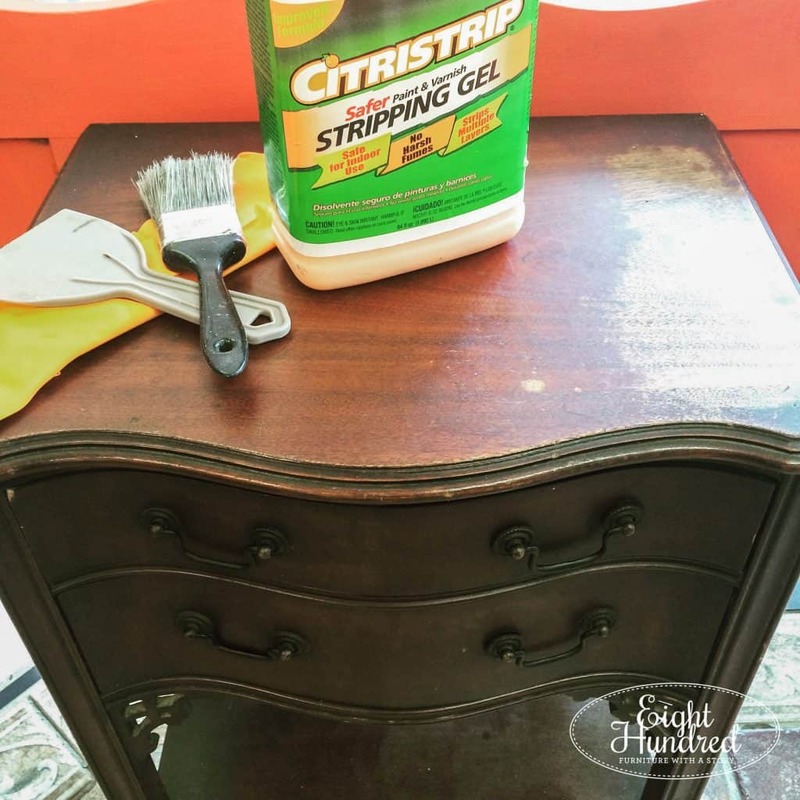 I always useCitristrip when I am removing paint or stain. It smells like oranges and is safe to use indoors. I’m big on using products that have no odor. There are plenty of non-smelly options nowadays and it seems silly to put your lungs at risk if you don’t need to. 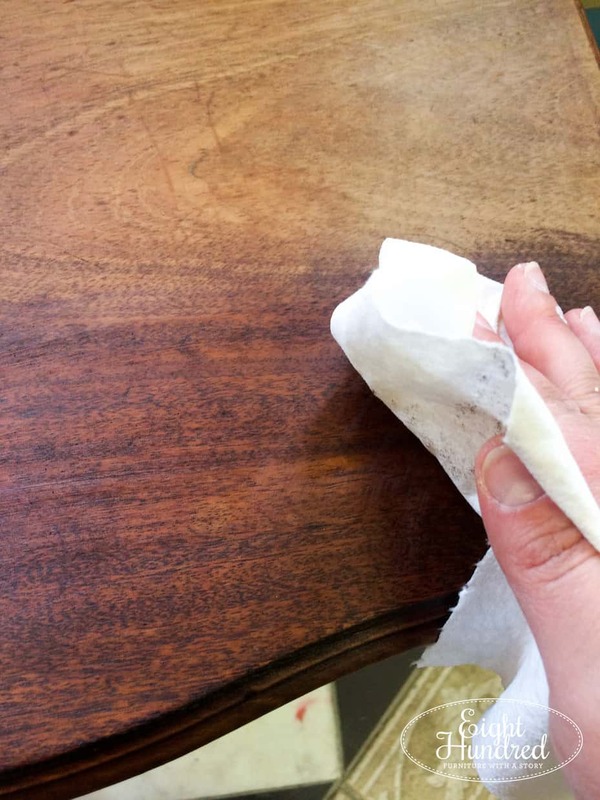 Put your gloves on and use a junk brush to apply the Citristrip all over your piece, including the edges. This paint brush was from the dollar store. You want to spread the stripper out as evenly as you can. 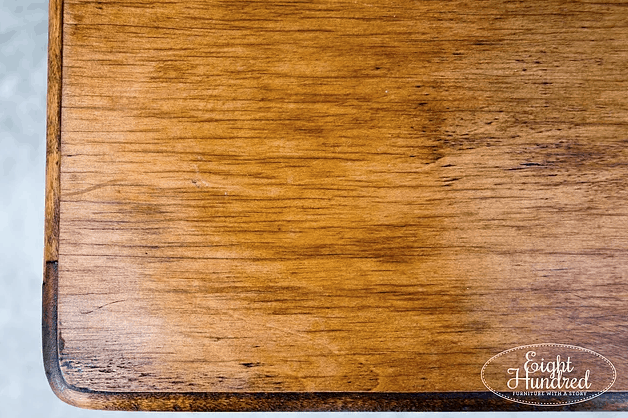 Any thin spots won’t strip well and you may have to repeat the process. Unfortunately, I don’t have any photos of this part of the process. I’m a one-woman show, so it’s pretty difficult to take photos while my hands are gunked with chemicals. I’m sure you understand! 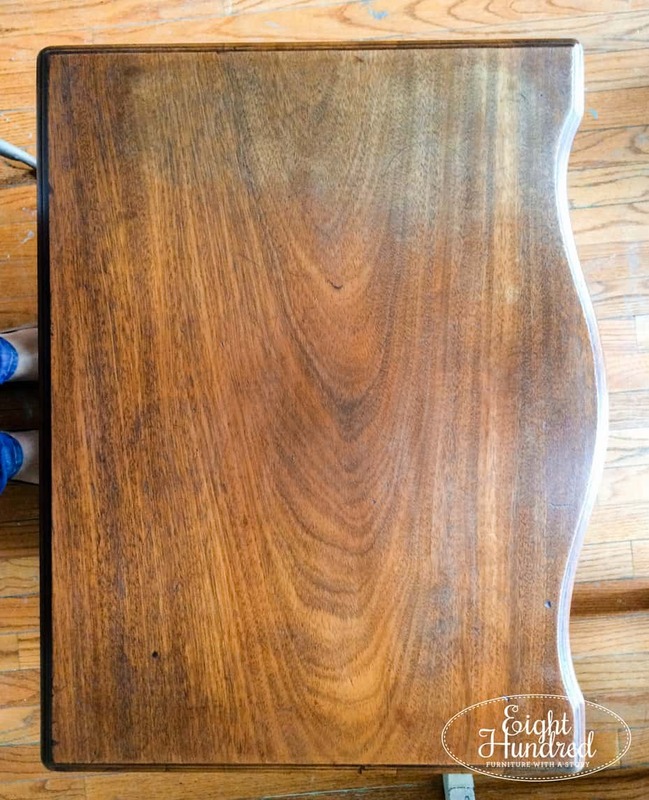 If I’m removing stain or just one layer of paint, I find that 20-30 minutes does the trick. Make sure you read the label on the Citristrip bottle to see what the manufacturer recommends. If I’m stripping multiple layers of paint, I find that I need to let it sit longer and it takes me two or three rounds until everything comes off. Test a small area with your plastic scraper and if it comes up, keep on going! Follow Citristrip’s and your local township’s recommendations for proper disposal. After you’ve removed most of the “goo”, take yourOdorless Mineral Spirits and your 0000 Grade Steel Wool and clean the surface. (Note: Steel wool is not the same thing as Brillo pads. Brillo pads have blue soap in them, so don’t use those. Trust me.) 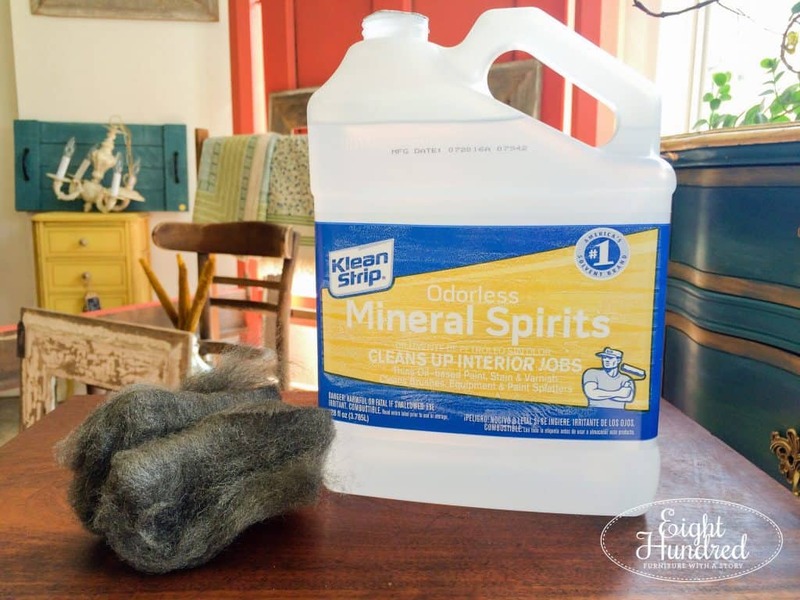 The mineral spirits will help to remove the stubborn “goo” that’s left and the steel wool will gently sand your surface. 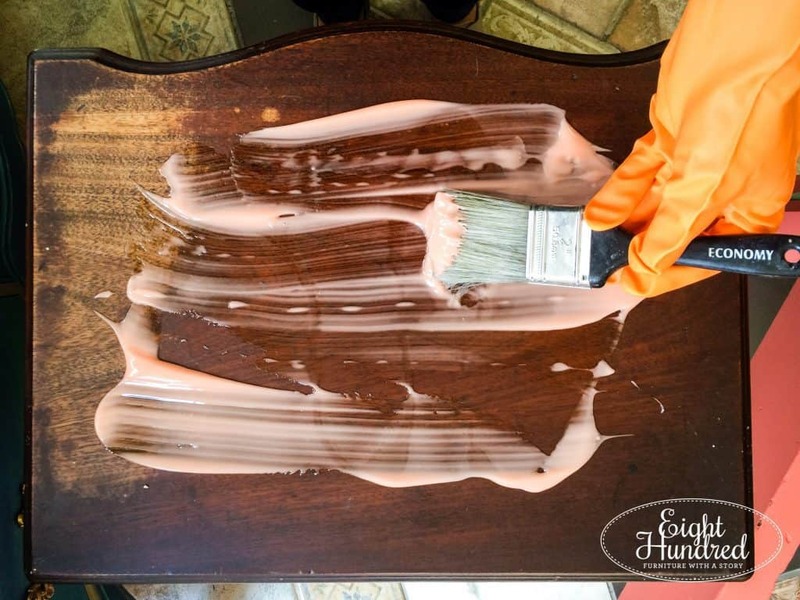 Fun fact – the color your wood takes when it’s wet with Mineral Spirits is what it would look like if you applied Miss Mustard Seed’s Hemp Oil (just in case you were curious). After your piece is clean, let it dry completely. This is the point where you can get an orbital sander to further smooth your piece and get rid of any gouges, ring marks, or nicks. This piece has a pretty thin piece of veneer on the top, so I didn’t want to risk burning through it with a sander. 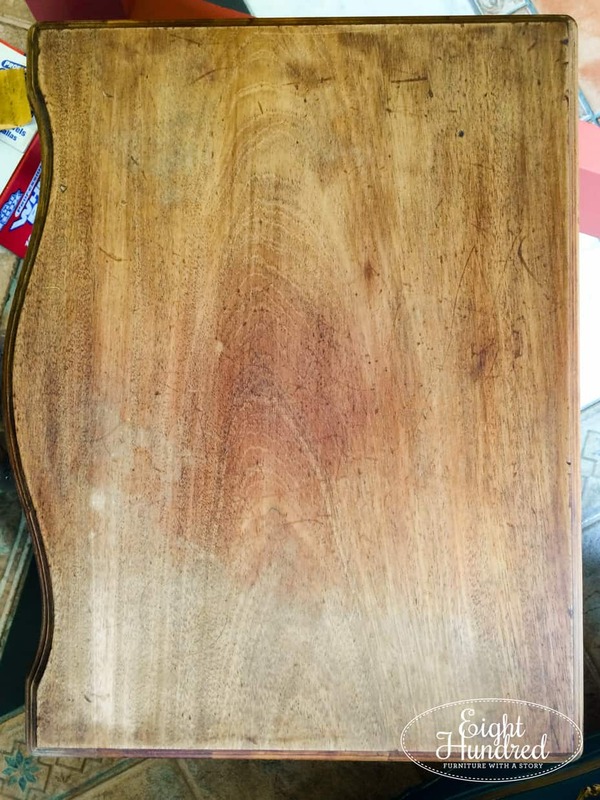 Using 220 grit sandpaper, I gently sanded the top until it was as even as I could get it. 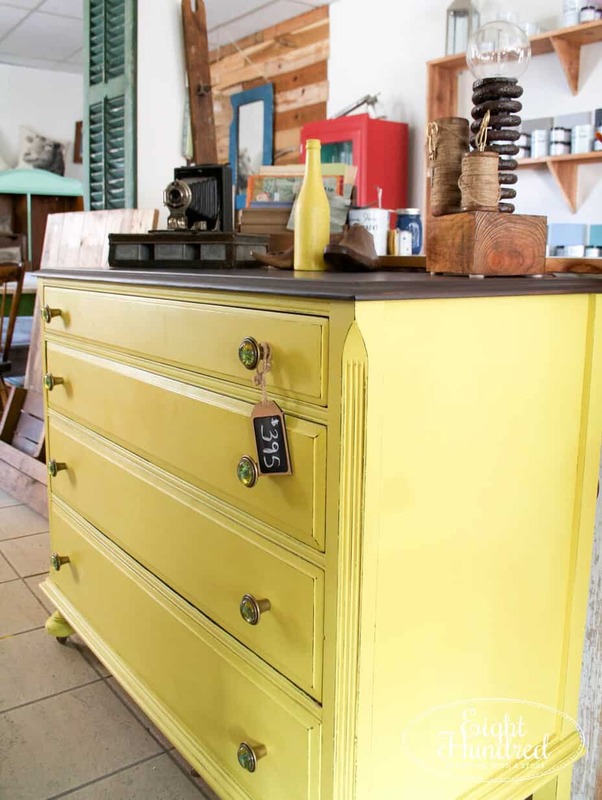 Since you have removed the old paint and stain from your piece, it’s time to replace it with a fresh new color. 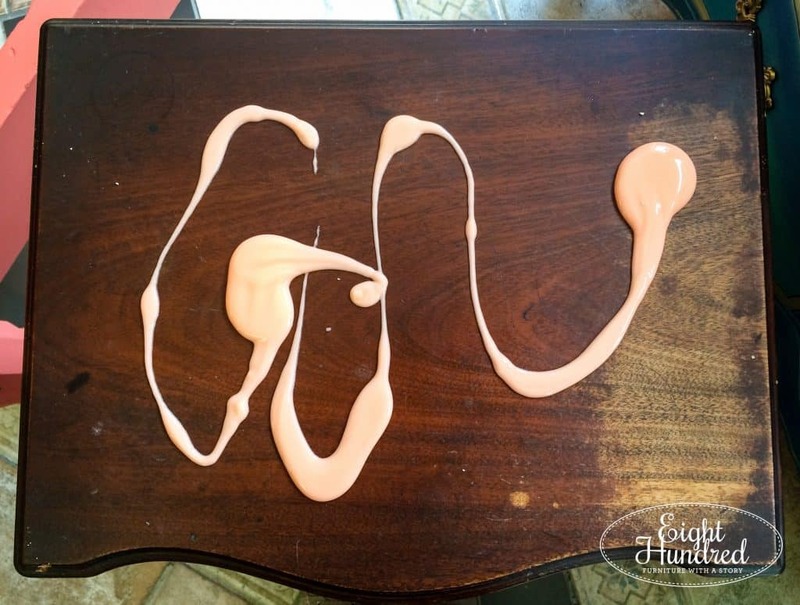 You can use any type of stain you wish. 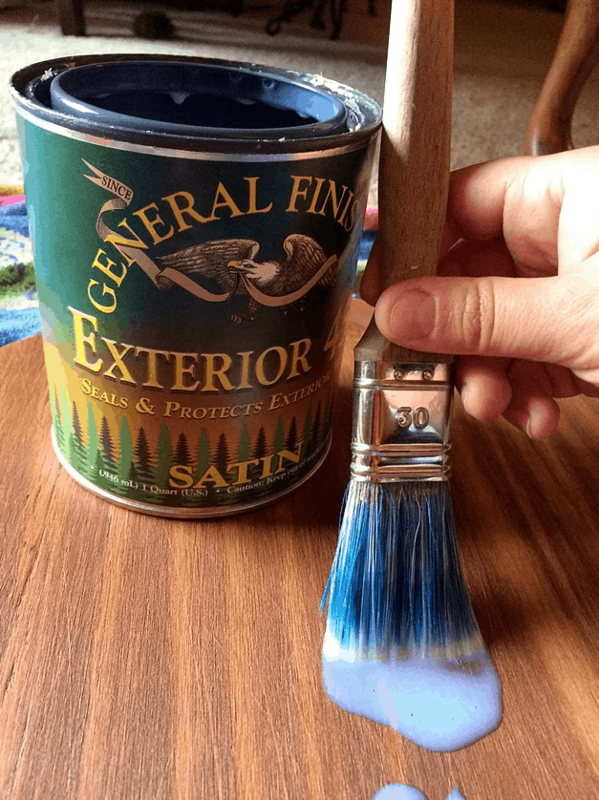 I’m a super huge fan of General Finishes Java Gel Stain. I’ve done a few pieces with this product. 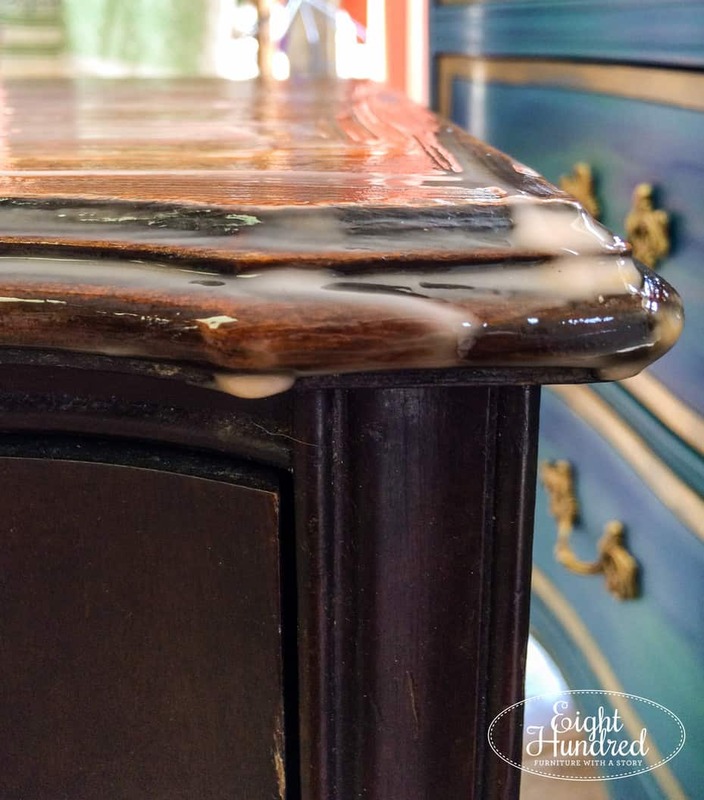 I’ve started using Annie Sloan’s Dark Soft Wax to finish wood tops as well. 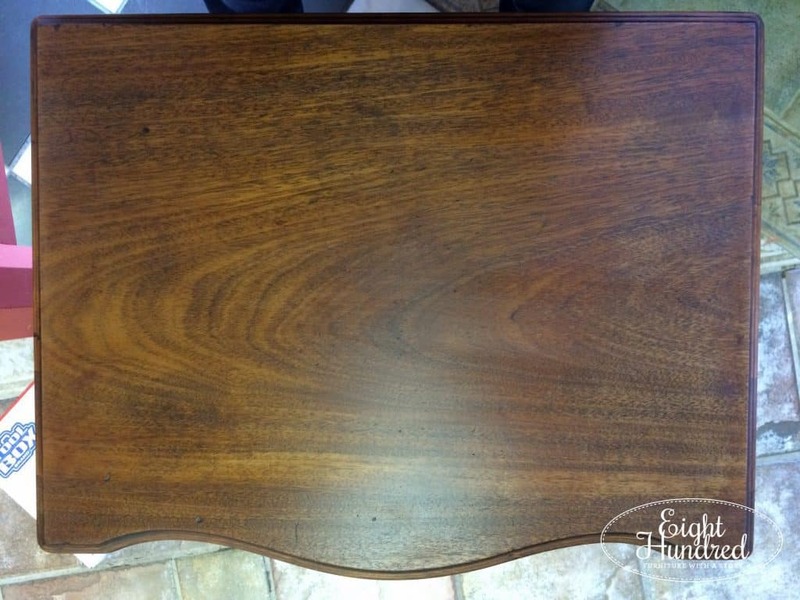 It acts as a topcoat and stain in one. 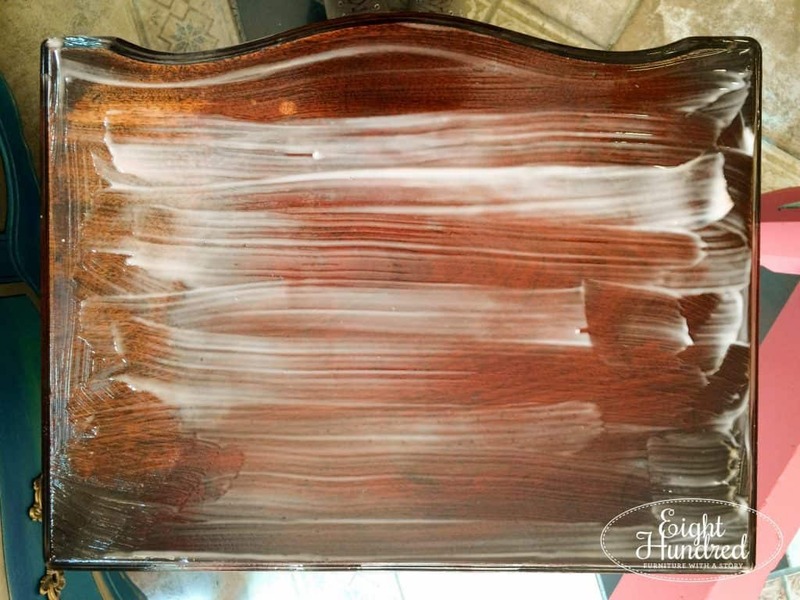 I tried it on my Emperor’s Silk Washstand and the results were beautiful. I decided to use the same technique with my nightstand. 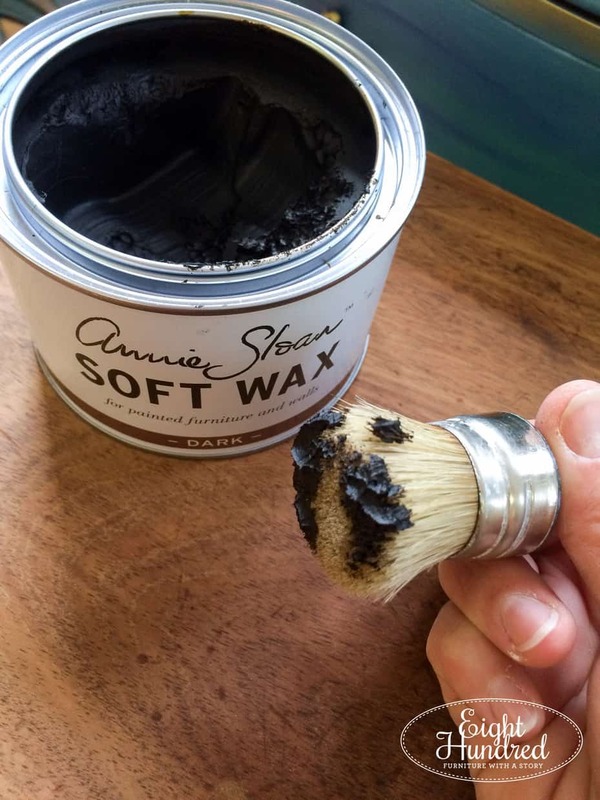 If you want to try it, take a wax brush and dip it into your Dark Soft Wax. It’s OK if you’re a bit heavy-handed because you’re going for color. Brush it on and get into every little nook and cranny. Using a shop towel, wipe off your excess. You may need to repeat the process to get a deeper color. This is my top after 2 coats. I allowed 24 hours of drying time in between. 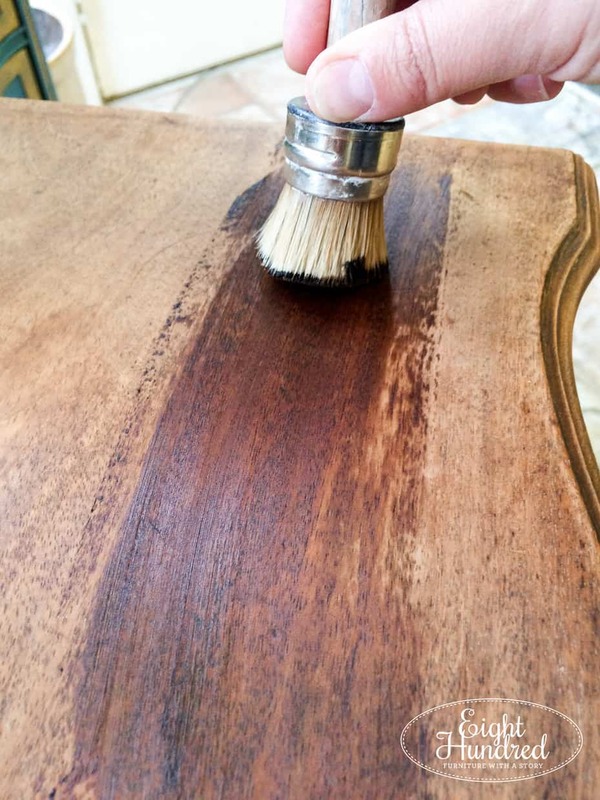 If you used a traditional stain, this is the part where you seal it with multiple coats of your topcoat of choice. 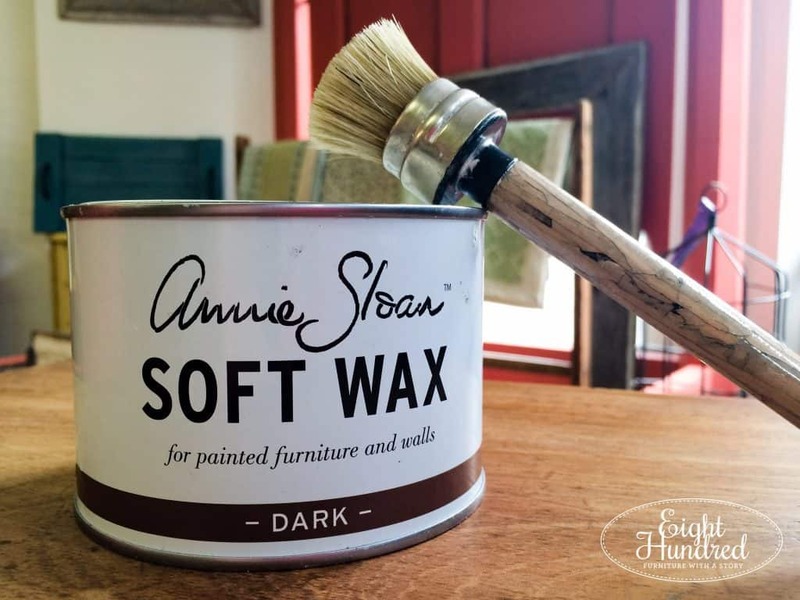 If I’m using Hemp Oil or Annie Sloan’s Dark Wax, this step is rolled into the staining part. I’m a big fan of General Finishes High Performance Topcoat in Flat and Satin. 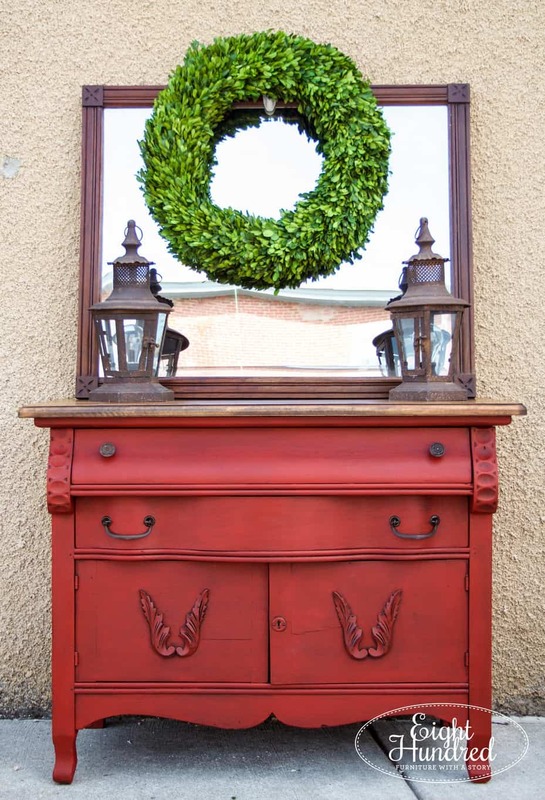 They also make an exterior topcoat as well for items that might go on your porch or patio. So there you have it! My nightstand is still “in process” so I’ll make sure to post photos when it’s finished. For now, go find a piece of wood to revive!